It’s always nice to get a phone call from your beloved. It’s especially nice when she’s calling from the airport at the end of a business trip to let you know she’s about to come home to you. The only thing that makes it better is when she’s calling you up to ask which of the large list of bourbons you’d like her to pick up for you in the duty free shops. The answer to which, of course, is “any I’ve never heard of”. 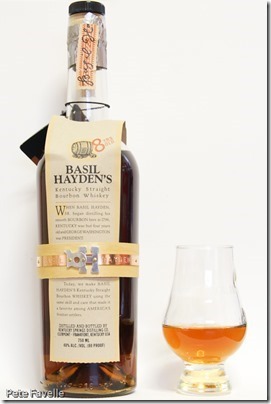 This is Basil Hayden’s Kentucky Straight Bourbon Whiskey. I know you shouldn’t judge a book by the cover, or a whiskey by the bottle, but there’s something undeniably appealing about this one – the old fashioned paper label and the initialled copper band holding it on the bottle (let’s temporarily ignore the fact that it’s glued on) help to give the impression of a small, historical product. Of course, that’s all marketing – in fact, it’s one of the Small Bourbon collection from the mighty Jim Beam. 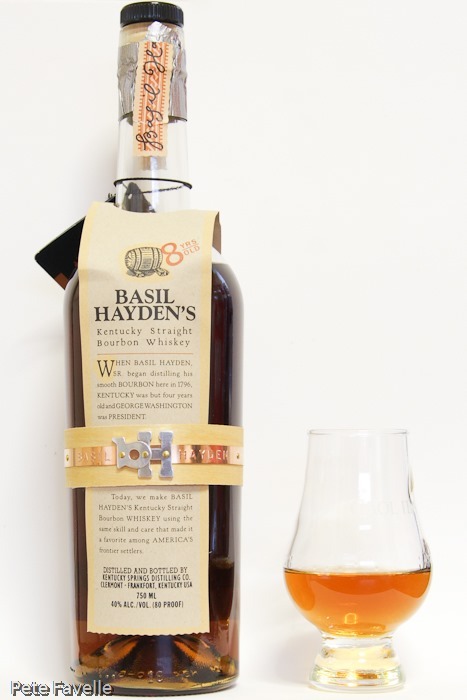 To be fair, it does have some history behind it, having been in production for over 200 years since the original Basil Hayden started distilling in 1796. It’s a gloriously rich, deep golden colour – impressively dark given it’s relatively short 8 years in the cask. The nose is sweet fudge, with a gentle alcohol warmth to it. There’s also dried fruit, and together they give a impression of a rich fruit cake. The syrupy sweetness with that fruit gives it an almost Pedro Ximenez-like aroma. A splash of water cuts down on the sweetness, but the dried fruit remains. Hints of peppery spices start to come through, along with a whiff of light honey. In the mouth, it’s less sweet than the nose suggests – an almost creamy texture, with dark raisin flavours and a slightly sour tang, leading into a nicely peppery finish. Water makes it gentler, with both the fruit and the sourness fading into the background allowing the spice to become more apparent, along with a touch of honey which puts me in mind of a spiced honey bun. While not hugely complex, it’s a very pleasant, sweet and peppery, easy drinking bourbon that earns 3 stars. I remember having this bourbon about a year ago and loving it. I distinctly remember the sweet/sour/spicy taste. Quite delicious.